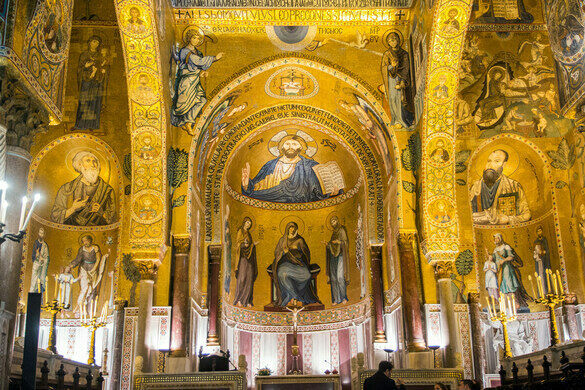 The Norman-influenced era in Sicily was a time when arts, science, and philosophy flourished in a melting pot of both Western and Middle Eastern culture, and this open exchange can be seen in the stunning Cappella Palatina . Located on the second-floor of the popular Palazzo dei Normanni (in English, Palace of the Normans), the breathtaking Cappella Palatina in Palermo is an impressive relic from illuminated society. The chapel was built in 1140 under the kingdom of Ruggero II of Sicily, the result of craftwork from all across the Norman world. The set-up of the chapel mirrors the traditional Roman basilica layout: a three-nave longitudinal body divided by rows of granite columns with Cipolin Corinthian capitals bearing Islamic ogive arches over to the roof. 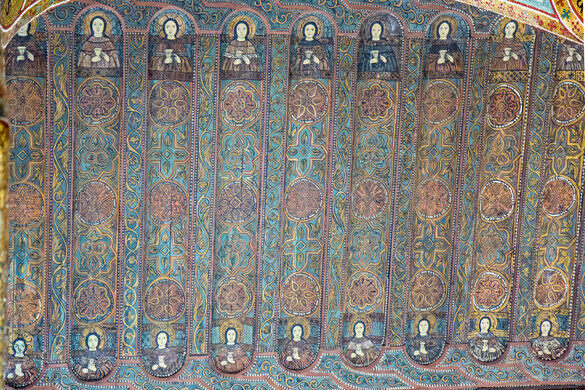 The roof is a vaulted wooden surface decorated in traditional Islamic designs, comprised of complicated and somewhat mind-blowing geometries called “muqarnas.” The rest of the interior surface is entirely decorated with surprisingly complementary Byzantine mosaics depicting the story of saints Paul and Peter. The sheer amount of gold and vibrant colors covering every surface of the Cappella Palatina almost make the architectural flourishes hard to detect. Visitors can easily spend more than a day taking in the intricate craftsmanship on display in the chapel, pondering less when the details were created, but by whom. Behind medieval walls in a corner of bustling Palermo is a breathtaking former mosque once inhabited by a wolf-taming hermit. An abandoned shopping gallery built during Fascist Italy tucked in the center of Palermo.